After a surprising assault on the ECW Heavyweight Champion, Sabu, how will “Ravishing” Rick Rude protect himself from the fuming champion? Will we meet his mysterious client tonight in Toms River, New Jersey? After hearing from the ECW Tag Team Champions last week, will they make good on their threats made to The Gangstas who have stolen their gold? On top of appearances by Bam Bam Bigelow, Rob Van Dam, and The Dudleys, all these questions and more will be answered on this episode of Extreme Championship Wrestling Resurgence! 1. 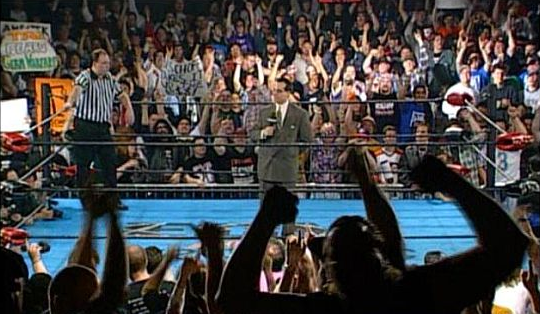 Opening segment: Joey Styles stood in the ring alongside “Ravishing” Rick Rude. Rude carries with him the same Singapore cane from last week, as well as a briefcase. Before Styles is able to open the show on the mic, Rude snatched it away from him after setting down the briefcase. After stand through a “F*** you, Rude!” chant, Rick began, “Listen up, you New Jersey nitwits! Tonight, right before your very eyes, you will meet my client! A former Extreme Championship Wrestling Heavyweight Champion! You all loved him, and he never gave a s*** about any of you! And Sabu, if last week was any indication, my client will make short work of you and be the champion quicker than you could dry clean one of those turbins you wear on your head!” Rude held up the cane, looked into the camera, blew a kiss into it, and gave it a wink. “Now, Joey Styles, I bet you’re wondering what’s in this briefcase I have here with me tonight. Well, let me tell you!” Rude reveals from the briefcase a contract for a championship match at ECW Heatwave on the nineteenth that he states is already signed by his client. He says that if Sabu is even one half of a man, he will sign it tonight! Sabu rushed the ring with a chair and Rude was unable to escape in time. Sabu cracked Rude with a chair and busted him open. Sabu then took the contract and smeared it into Rude’s bloody forehead, pointed to the sky, and left through the crowd. 2. Commercial break + Information video package and ticket prices for ECW Heatwave 1997 being held in Queens, New York in nine days. 3. Bam Bam Bigelow returned to ECW Resurgence this week in singles competition to take on Stevie Richards. It was a pretty one-sided, as Bigelow put Richards through the wringer. Bigelow looked as impactful as ever, utilizing the ringside apron and railing heavily. He defeated Richards after hitting a huge Bam Bam Sault in the middle of the ring. Afterword, Bigelow grabbed a mic and called his fellow Triple Threat members down to the ring. 4. Triple Threat Segment: Bam Bam looked over both men and questioned why they hadn’t called him, or reached out to him while he had been gone from ECW the past couple of weeks. Lance grabbed the mic from him, “Listen Bigelow, I’m the one that brought you into the Triple Threat. After you picked the bones of Shane Douglas, you must’ve thought that meant that you were the man… Well, you’re not. I am. Mike Awesome and I both agree that we’ve been the ones putting the work in while you’ve been off doing who knows what!” Bam Bam began to lose his temper, but caught himself. “You’re right, guys. I have been gone when you needed me. But, that time is over! I’m here to stay and ECW is going to know I’m here to stay! After two weeks, I’m more refreshed and dangerous than ever before. And where is Shane Douglas? Still on the damn shelf! He’s the first of many. That’s my pledge to The Triple Threat.” The three men hug and high five as their theme played on their way out. 5. Rob Van Dam defeated PG-187 in a great singles match. The two barely did battle outside the ring and kept it strictly professional. After PG-187 picked up the upset victory, Rob Van Dam shook his hand seemingly turning a new leaf. However, he quickly gave him a spin kick to roaring boos from the crowd. RVD shrugged, taunted, and exited. 6. Commercial break + Hype Central merchandise info. 7. D-Von and Buh-Buh Ray Dudley defeated The Gangstas after heavy interference from the ECW Tag Team Champions, “Prime Time” Lee and “Killer” Kronus. After only about five minutes, the champs appeared with lead pipes in hand in pursuit of their stolen titles. The Gangstas put up a solid fight, but the numbers were too much. After leveling the Gangstas and working together with The Dudleys to do further damage, Kronus and Lee were able to steal back the ECW Tag Team Championships from The Gangstas. 8. Saturn defeated the loudmouthed Danny Doring after putting him down with a huge Death Valley Driver! Saturn made quick work of the self-proclaimed undefeated man and presumably shut him up for good. Saturn got and needed to get the job done to prove a further point and make an example. 9. Taz Interview: Bill Alfonso and Taz stood by in the back. Taz pacing back and forth while Bill Alfonso began to speak. Before he could get a word out, Taz pushed him off camera and spoke right into the lens. In a near shout, Taz spoke with a purpose. “Saturn! You don’t put one ounce of fear, worry, or respect for you in my body! You trying to hold a candle to “The Human Suplex Machine” is a joke and an embarrassment to ECW, and to my ECW Television Championship. And let me tell you, son. When you embarrass my championship, you embarrass me. And when you embarrass me, you cease to exist. You want to tap me out, you can’t! You want to take my championship, and you can’t! You want to survive “The Human Suplex Machine”? And you can’t, Saturn! After I shut you up at Heatwave on the nineteenth, you’ll be the joke and the embarrassment!” After Taz was finished, he pushed the camera away. 10. Commercial break + Upcoming ECW Resurgence dates information. 11. Rick Rude Segment: A very groggy Rick Rude made his way to the ring, grabbed a mic, and began. “Sabu, you idiot. You busting me wide open earlier tonight has only angered my client further! You will regret what you’ve done tonight! You didn’t have the balls to sign the contract, so now, there will be no match! After you attacked me, an inactive wrestler, you showed your cowardly colors, Sabu. My client and I mistook you for a man, not a little b****!” Sabu once again ran down to the ring, but before he was able to attack Rude again, a commotion occurred ringside. The Sandman, dressed in a full suit holding his Singapore cane and smoking a cigarette, jumper up into the ring and cracked Sabu with the cane. Sandman caned the hell out of Sabu much to the pleasure of Rick Rude. The crowd nearly got worked into a riot as Sandman and Rick Rude put the boots to Sabu.